My name is Lee (on the right) and I’m 19 years old. I’m from Great Neck and I’m currently a sophomore at Quinnipiac University studying print journalism. 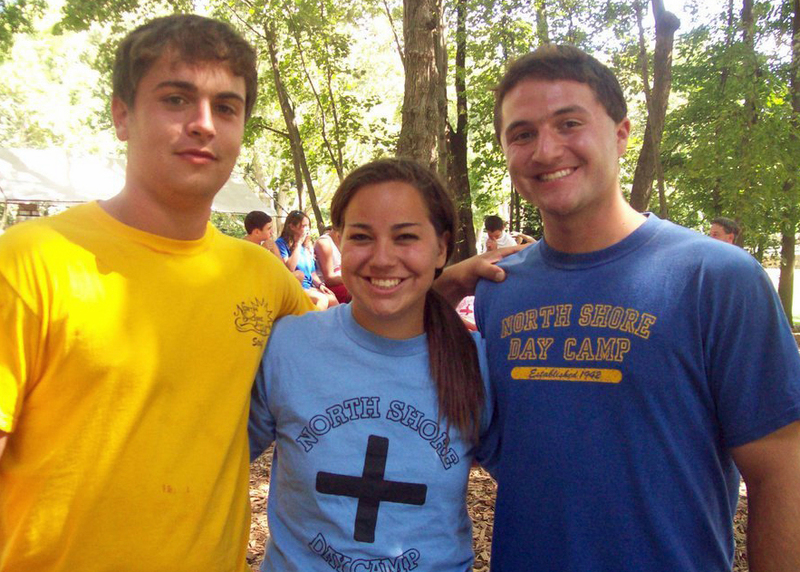 I came to North Shore Day Camp as a camper back in 2002 along with my brother Mitchell who was in 2nd grade at the time, so I credit and thank my mom and dad for sending us. Little did I know that this place was going to be my second home! The most important thing to know about me is that I love sports and everyone at camp knows that about me! In 5th grade, my camp nickname was Ripken, because I would wear Cal Ripken Jr.’s jersey twice a week (washed of course – thanks mom!) I’m also a big Mets, Jets, Knicks, and Rangers fan. My brother and I both played baseball each summer while growing up. Many times after the camp day was over, already exhausted by the fun at North Shore, we would hectically rush off the bus, change into our uniforms and be on our way to the diamond. Life was simple then – my responsibilities were to just have fun and be a kid, which I did. I was the captain of my baseball team in high school and playing baseball is still my favorite hobby today. However, my responsibilities have since changed, although the concept is still the same – to have fun and try to make everyone around me have fun too. I’ve been a group counselor at NSDC for 4 years and this summer will be my 5th. I still can’t believe that this will be my 11th consecutive summer! Last year I was a third grade counselor and also the Commissioner of League. It’s a strange feeling knowing that I played in League as a camper and then ran it as a counselor. As a huge sports fan, I love the competitiveness of League and the outstanding sportsmanship which is demonstrated by each of the campers – a philosophy that NSDC encourages through it’s STARFISH Program. There are a lot of things I love about camp. Of course the sports, the trips as I got older and became a Voyager, and the great friends I’ve made and kept throughout the years. I’d have to say my most favorite memories are waiting on the front porch of my house with my brother, my mom, and my dog Wrigley for the North Shore bus to pick us up. My brother and I would wait to see the bus turn the corner on to our street, and when it stopped we would run down the driveway and wait at the sidewalk for our bus counselor to walk us across the street. That feeling of excitement that my brother and I felt seeing the first glimpse of the bus is a feeling I’ll never forget. North Shore was a great place to grow up as a child and I hope that my campers have as much fun as I did.